Buttermilk is a useful ingredient to have on hand. Refrigerated, it keeps a long time, usually way past its sell-by date. Too, buttermilk is one dairy product that a lot of people who are lactose intolerant can actually consume. Originally, buttermilk was made from the whey left over from churning butter, but most of the buttermilk you will find in the grocery store today is “cultured.” That is, it’s made by combining milk with a lacto-bacillus starter. These friendly bacteria eat the tummy-upsetting lactose, or milk sugars, in the milk, converting them to acidic lactase, which is easier to digest. Buttermilk’s acidity makes it especially useful for baking. When mixed with baking soda and baking powder, the combination creates gases that give a lift to un-yeasted baked goods, while at the same time adding a satisfyingly tart dairy flavor-note to the finished product. Buttermilk is especially welcome in recipes calling for whole grains, which otherwise might be unappealingly leaden. The recipe below for buckwheat waffles is a great example – even with a 50-50 split between whole grain and white flours, the waffles cook up nice and light. Buttermilk made with living cultures is, when uncooked, a pro-biotic food, one that delivers good-for-you microbes to the digestive tract. There’s no need to drink it by the glassful to get this benefit. Simply add raw buttermilk to chilled soups, smoothies, or as in the recipe here, use it as an ingredient in salad dressing. I particularly like buttermilk salad dressing poured over sliced avocados – the fatty avocados are beautifully balanced by the tangy dressing. 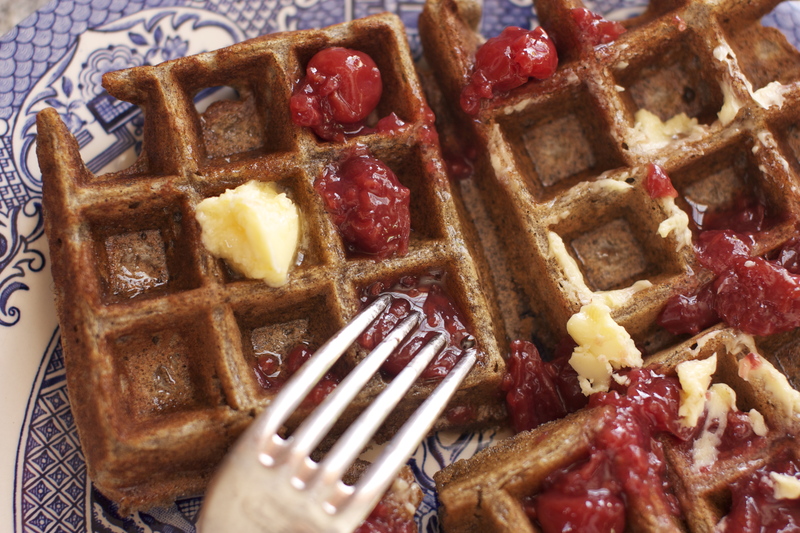 Buttermilk Buckwheat Waffles with maple syrup, butter and cherry jam. Whisk the eggs together in a small bowl. Whisk the melted butter into the eggs, then whisk in the buttermilk. Set aside. Whisk together in a larger bowl all of the dry ingredients. Add the wet ingredients and stir until well-incorporated. It is all right if there a few lumps. Let rest a few minutes before continuing. Use a cup or ladle to pour enough of the batter into the heated waffle iron to come about 1/2 inch from the edge of the waffle form – the batter will spread and expand as it cooks, so don’t overfill. Close the lid of the iron. Cook, monitoring the heat carefully, until the waffle is beginning to brown on the first side, then flip the waffle iron over and continue cooking until the other side is golden brown. Serve immediately with butter, jam and warm real maple syrup. You will have enough batter to make five or six 7 inch by 7 inch waffles. 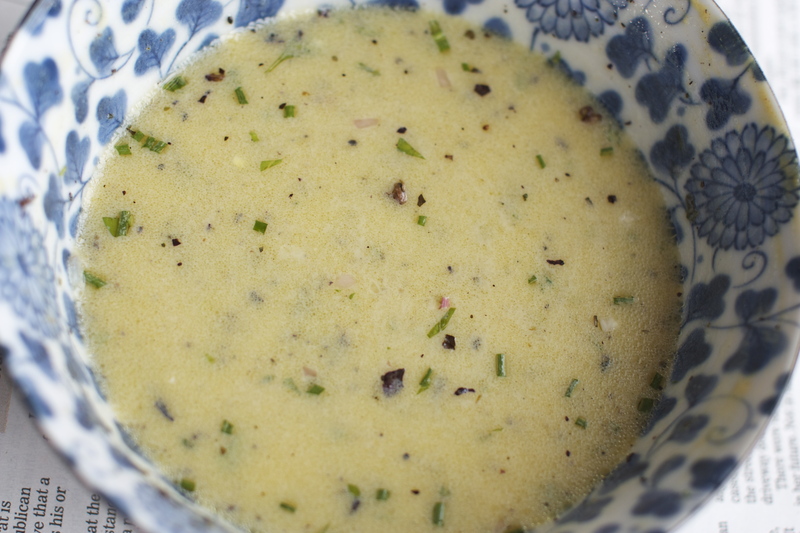 Tangy Buttermilk Salad Dressing with fresh herbs. Combine the mustard, shallots, vinegar, buttermilk and salt in a bowl and whisk together well. Drizzle in the olive oil, a little at a time, whisking like crazy as you do so that the mixture emulsifies. When all the oil has been added, stir in the fresh herbs and ground pepper. Taste and adjust the flavorings with a little more oil, vinegar, salt or herbs and pepper, if desired. This will probably be enough dressing for a few meals, as you will need only a tablespoon or two for an individual salad. Makes about 3/4 cup. This entry was posted in breakfast, buckwheat, buttermilk, salad dressing, salads, Uncategorized, waffles and tagged buckwheat, buttermilk, salad dressing, waffles by Cold Garden Warm Kitchen. Bookmark the permalink.